Not only does investing in pre-marriages matter around here, investing in marriages matters to us! And because of that, we are making a Date Night experience available to couples of all ages and stages. Each Date Night is written so that any couple of any age can participate. The dates require very little prep and involve little to no additional cost beyond a standard night out. And the date night is intended to be FUN! That’s right . . . FUN. We believe couples need some fun – it helps them remember what they like about each other and deepens their connection. Our Date Night is scheduled for the evening of Friday February 22nd. To participate along with us, simply print off instructions here or pick up a copy at the Welcome Centre. If February 22nd doesn’t work for you, no problem at all! Simply choose another date that weekend or even this month and set aside some time to connect with your spouse. Be sure to follow us on social media as we will be cheering you on as you invest in your marriage. 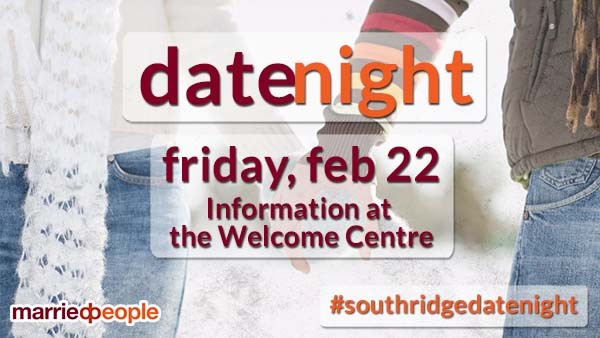 When you have your date night, we would love it if you could post on social media a photo and the hashtag #marriedpeople #southridgedatenight – we all want to be cheering each other on as we invest in our marriages this month. Download your Date Night Instructions here! We also asked some of our staff to add their favourite love song to a Date Night Playlist! So if you’re needing some music to add some fun to your date, you can check it out here!